Winter has definitely arrived here in the Philly Burbs this week. When I took Owen to the bus this morning, it was 21 degrees. . .and that's the high for the day. 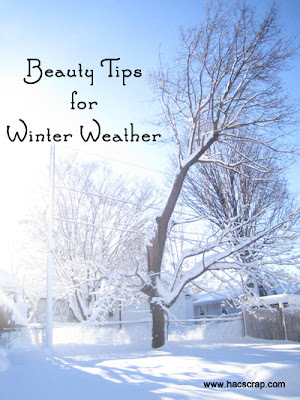 But don't let winter cramp your beauty routine. We all know that winter weather can wreak havoc on our hair and skin. . .between the cold air outside and the dry heat indoors, our skin can feel tight and look flaky and our hair can really dry out too. Turn the heat down in your shower. Hot water can strip your skin and hair of natural moisture. Use a rich moisturizer after your shower. I've been a long-time fan of St. Ives Daily Hydrating Lotion. Keep you hands moisturized, especially around your cuticles to ward off hangnails. I'm a fan of Burt's Bees Hand Salve. Wear a hat to protect your hair. Use a moisturizing product on your hair after you shower. I'm currently using Moisture Cure by Matrix. Try to limit your use of heat appliances. Drink plenty of water - it is the best hydrator even in winter. What are your best winter weather beauty tips? 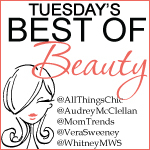 I'm linking up with Whitney over at Mommies With Style for #BestofBeauty Tuesday. Yeah, I'm guilty of the hot water as well. I can't help it and I'll take the dry hair to stay warm in the one place I am alone! ;-) Love these ideas! Great advice, though I won't give up my hot showers!